Many people labour under the misapprehension that chocolate and water don’t mix, but in actual fact, nothing brings out the pure taste of chocolate better than water. Although cream is traditionally used in ganache, it tends to alter the flavour of the chocolate. It also adds A LOT of calories to the ganache. So, if you love ganache – who doesn’t? – you simply HAVE to try this recipe. I can guarantee that you won’t be disappointed! With this recipe, you just chuck it all together and melt. Note: the quality of the ganache will depend solely on the quality of the chocolate. If you aren’t fussed, use stale chocolate bars. If you want the best of the best of ganaches, use the best chocolate you can find. This is my Godmother’s Chocolate Water Ganache Recipe and it is both simple and divine! Coffee: half a teaspoon of coffee dissolved in a teaspoon of boiling water – this will enhance the taste of the chocolate! Chilli: you can always add a pinch of dried chillies or chilli powder to your ganache. This is a particular favourite of my Christina’s and makes the chocolate taste “warm”. People often mistake the taste, if subtle enough, for added alcohol. Once the chocolate is all melted, keep heating and stirring the ganache to let some of the water evaporate. If you are intending to keep the ganache, place it in a clean mason jar and keep it in the fridge. It will last for ages and ages (if you don’t eat it all first). The ganache will become very stiff once refrigerated so if you want to use it as an ice-cream sauce later on, just spoon out a little bit and blast it in the microwave for a few seconds to make it nice and runny again. If you have your heart set on cream ganache, Savoury Sweet Life has a lovely recipe and tutorial for making Chocolate Ganache 3 Ways (glazed, whipped and piped). Her photos are beautiful! You might want to add some alcohol to your ganache. You COULD add the alcohol to the water and the chocolate before heating, but that would cause some of the alcohol to evaporate. Instead, you could make the ganache as stipulated above, heat some alcohol in the microwave for 10 seconds, and then mix the two. Alternatively, have a look at this Very Informative Post. If you are more interested in the Macarons than in the ganache, that’s ok too. I made the macarons using THIS TUTORIAL for Almost Foolproof Macarons by My Food Geek. 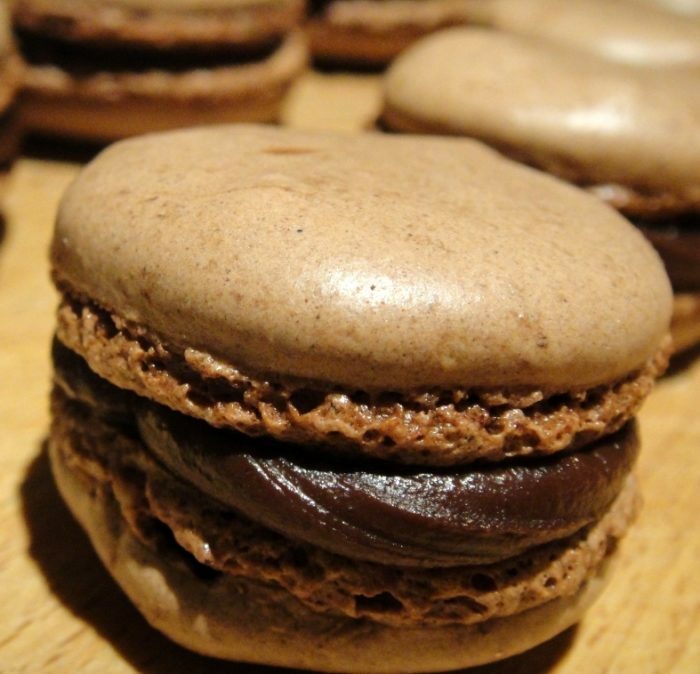 The recipe uses the Italian meringue method, which makes the macarons a lot more stable and a lot less prone to failure. I have made 3 batches now and all three of them came out lovely! Thank you for this posting :) How would you add alcohol to a water ganache? I would add it once I have finished making the ganache, warming it before adding (just slightly) and stirring it in thoroughly. You could also add it to the water and chocolate before melting, but that will evaporate some of the alcohol. Have a look at this very informative post. Can this ganache be whipped? I’d like to make it into more of a frosting, and I need it to be dairy free (I already have appropriate chocolate). Hi. I have used the water ganache recipe and THIS technique with success. Hi Suzy. I find white chocolate to be a tricky beast, almost as if it isn’t a cousin of regular chocolate at all… It buns so easily! This is the recipe I use when I make white chocolate ganache. Could i also pipe it on to cupcakes? Not when it’s just made. You can pipe it if you wait until it has set to exactly the right consistency, but I always find that it takes ages and ages to start setting and when it does it goes very quickly, so I always miss the window between runny and completely set. I’m going to make my mom a chocolate Bundt cake with a variation on a water ganache. I will use a Diet Coke reduction instead of water. What kind of chocolate compliments the taste of Diet Coke? Hi Anna. That is a brilliant idea, but I have never tried it myself, so am at a loss. I would guess dark chocolate, as diet coke is already fairly sweet! Shriya, the setting is dependant on the amount of liquid, not the type of liquid. This ganache will set firm in the fridge and can then be scooped into truffle balls. If it doesn’t set, just melt a little bit more chocolate and then stir the ganache into the melted chocolate. Refrigerate again and it should be good to go. Thank you for these instructions, my third search attempt, and I settled on your method as opposed to the microwave or adding boiling water methods. I made white chocolate water ganache as a topping for my white chocolate egg white traybake cake. Really delicious, tastes a lot like condensed milk. So glad you found it useful. Your cake sounds AMAZING!